GoPro just released their new Hero3 HD camera lineup, which boasts being 30% smaller, 25% lighter while being able to deliver 1080p in 60 frames per second and even 2.7K in 30FPS . 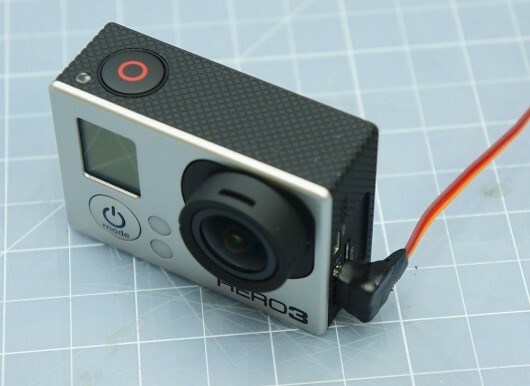 But while shrinking the camera, Gopro removed the 2.5mm video out jack. 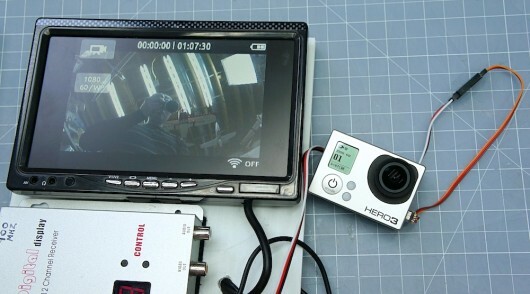 But fear not, the GoPro 3 is still able to output the composite video we need for FPV flying. 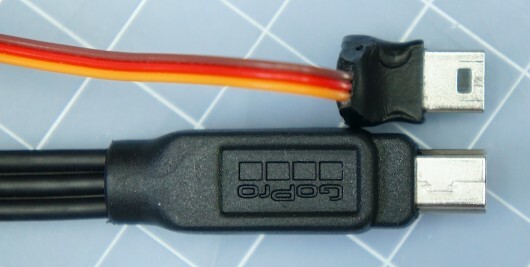 Instead of a normal 5 pin mini USB connector, GoPro chose the much less common 10 pin version. This connector now contains the standard USB pins as well as microphone input and the video output. Unfortunately it’s not as straight forward as simply soldering the cable to the connector. 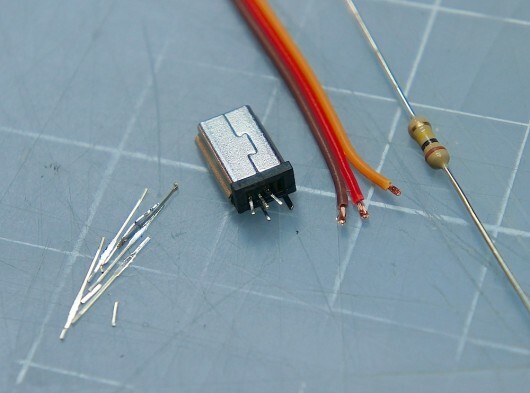 A 100K ohm resistor is also needed to kick the camera into video out mode. 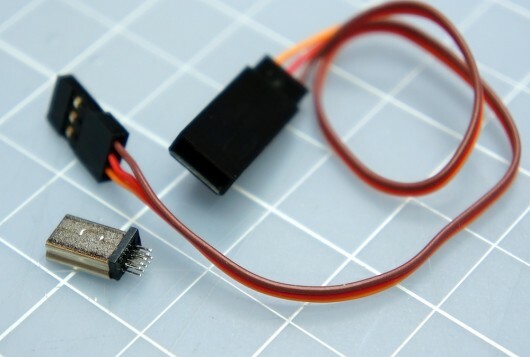 In this guide I’ll guide you through making your own cable, so that you too can enjoy the live output of this great camera, without having to dish out 20$ for a bulky cable from GoPro. First off you need to get your hands on a 10 pin mini USB connector. They can be found on various electronic stores online. I ordered mine here. You also need a 100K resistor. Any watt rating will do, as there will only be microamps going through it. I used a standard thru-hole 1/4W resistor I had laying around. It’s a little big so if you need to order the resistor I recommend getting a smaller one, like a 1/8W. You also need a cable of some sort. I used a 32 AWG servo lead, which is nice and thin. This is how we’re going to connect everything. I removed the unused pins to gain more space, reduce the chance of a short and make it easier to work on. I soldered the cables first, which I think is a good move as they are the most fiddly. 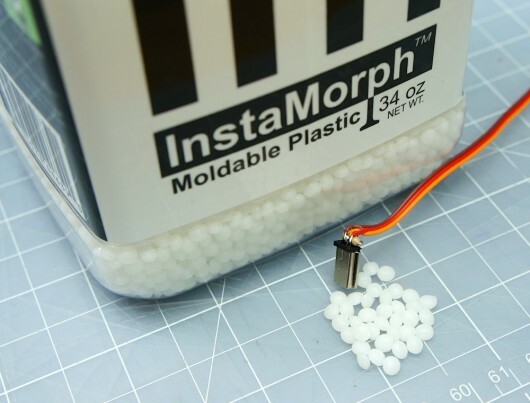 Do not use to much heat on the soldering iron or the connector and/or the insulation on the wires will melt. The resistor is connected between pin 7 (the ID pin) and ground. This is how I mounted my resistor. The metal case of the connector is connected to ground inside of the GoPro, but if you wanted you could connect it to the video ground pin instead. Connecting it to the case does make it very sturdy though and there is no chance of it shifting around. Pretty compact considering the size of the resistor. I wanted my connector to stick out as little as possible, so I bent the wires 90° back over the resistor. Yay! It works! Time to make the cable robust. Pretty streamlined but still easy to grab and pull out. The paint stick well to the Instamorph. Done! Works like a charm, low weight, robust and easy to plug in and out. What more could ask for? 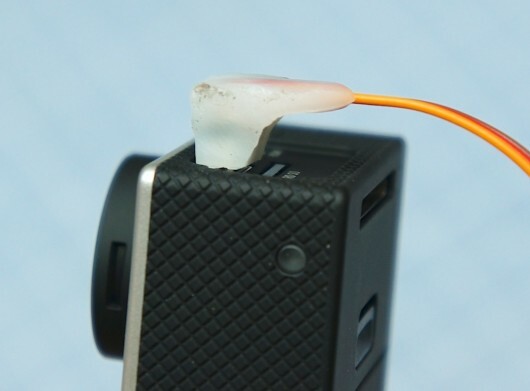 Here is the DIY cable vs the original GoPro cable. 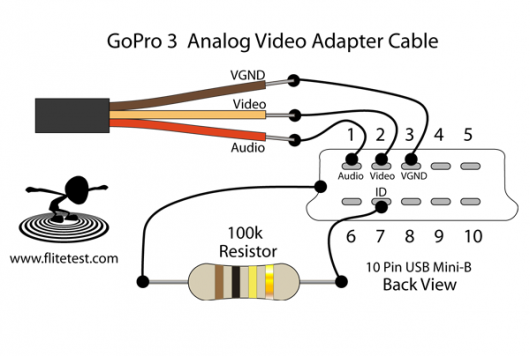 Now get out there and make awesome FPV videos using your new GoPro3 video out cable! This entry was posted in DIY, Projects. Bookmark the permalink. Wow the possibilities with The Insta-Morph are awesome. I can’t believe how sanitary that came out looking. Swedish kung fu soldering skills didn’t hurt either. Thanks for the share! 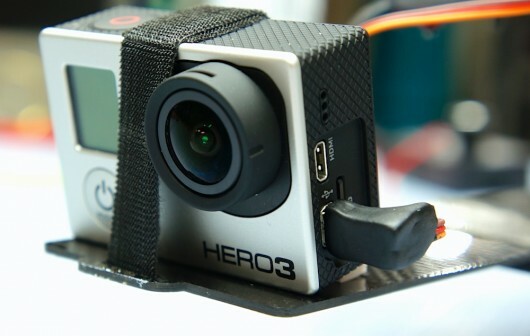 thanks David – just got my Hero3 – will be using this howto. 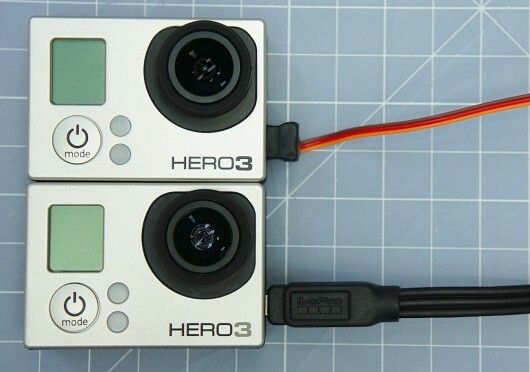 Hey can anyone tell me if the Go PRO Hero 3 (white, silver and black edition) can record in HD on Micro SD Card, take photos in an intervall and can source the analog video out for the FPV transmitter, at the same time? Great guide David, I can’t wait to see the video’s you get out of this cam. 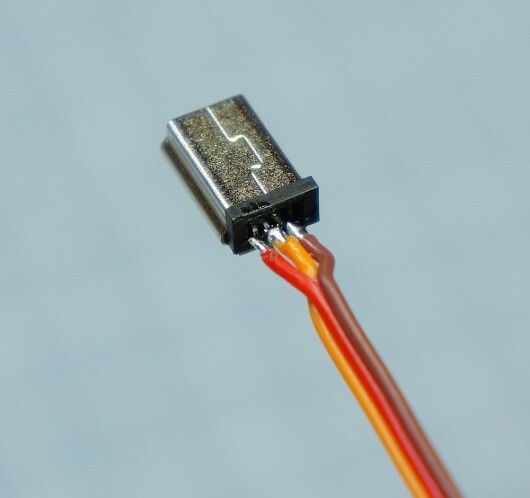 quick question where can i get the other end connector i have immersionrc style molex connector i am trying to find just the molex connector. Wow, you already have two Hero3 cameras! Nice mod. How about adding the power supply via USB (directly from BEC or via separate +5V regulator) and thus be able to remove the GoPro battery and save some tens of grams? At least GoPro2 runs OK without battery, powered from USB. holly crap! do you have pictures of what you made? i was just about to make mine. you cut pin? ground the resistor? which cable did you use? I foun right now something for you! Cheers for the link Mic. Shame there out of stock at the moment as thats a great price. Thanks for the link. Great price. hi just a question, how is it on the schematics the polarity of resistor is different than on your picture? A resistor has no polarity. hey, note to others: make sure your transmitter isn’t sending any power to the Gopro! I realized a bit too late that the transmitter I bought had Vcc along with video and ground wired into the 3 pin connector for the camera. I think I sent voltage into the GoPro audio-out pin for a split second and since then it hasn’t worked quite right. Don’t be stupid like me, check all your wiring! Thanks, I would not have figured it out by myself. ATTENTION: Please be careful and check your cables before first use! Some FPV transmitters like the “RC 305” push 12V on the cable which is marked here as audio cable! If you connect your Hero 3 camera without a change you will blow it up. To avoid that, you have to disconnect / cut the cable marked for audio use. DO NOT CONNECT it in this case. The “RC 305” (for example picture: http://fastie.net/wp-content/uploads/2012/08/RC305-20120825-0016.jpg ) Transmitter don`t need the audio connector because it has got a build in microphone. Instead of an audio input it has got a 12V power supply for cameras. Im talking about the Transmitter all the time. Not the receiver. I just built this cable and it worked. But there are a few things I wanted to mention here for future visitors. -First off, if you don’t know your equipment really well, Do NOT follow these instructions blindly for the reasons mentioned in the above posts… You need to know what you are doing!.. 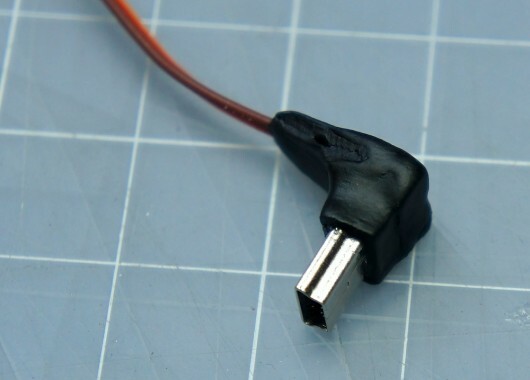 David did a great job by identifying the pins on usb mini-B connector for GoPro3 camera. I am grateful to him about it. I don’t know where I could find it if it wasn’t for him. I can verify that the pins depicted in the above pictures/diagrams are correct. Though, I wish David would have mentioned what application he made the other end (servo end) of the cable. My stuff does doesn’t use this type of connection. 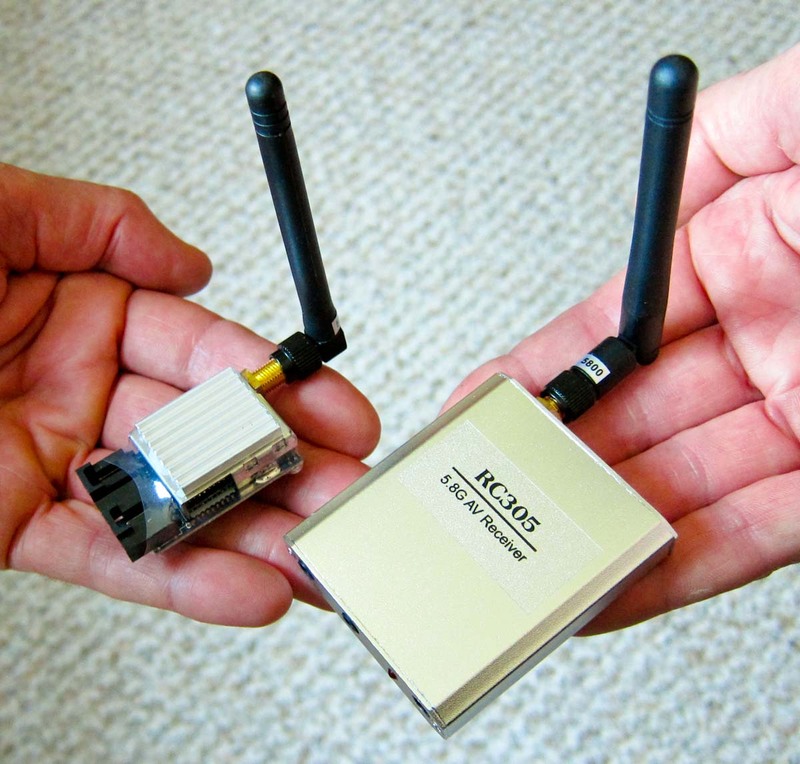 By “this type of connection”, I mean my stuff does NOT get the ground, video and audio on one single servo connector. 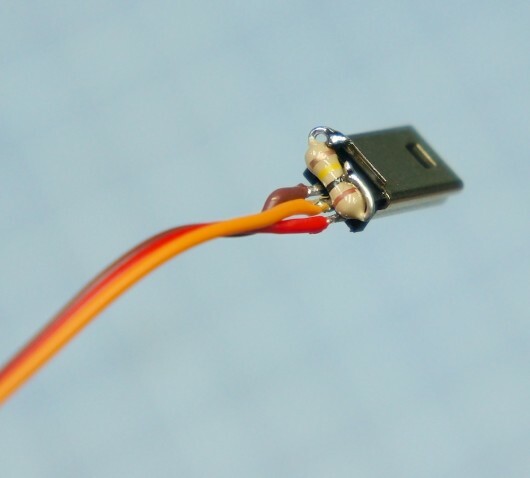 Actually, I am not aware of any FPV or video equipment that uses this type of connection. I am currently using EagleTree OSD and it takes the Video and Audio from separate servo inputs. With this said, I made my cable a bit different than how David’s showed here. 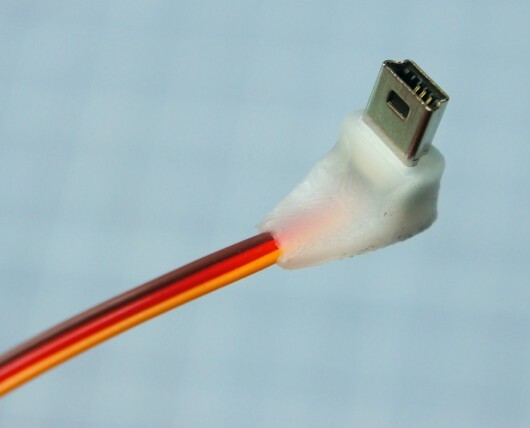 The USB part of the cable is exactly the SAME. I used David’s instructions including the 100 K-ohm resistor (though I am not sure why it was needed). But for the other end, unlike what’s shown here, I used 2 servo connectors: one for the Video and Ground and the other for the Audio only. This is pretty much same style as the how ReadyMadeRC makes his cables. And I think many FPV equipment uses this kind of connection. 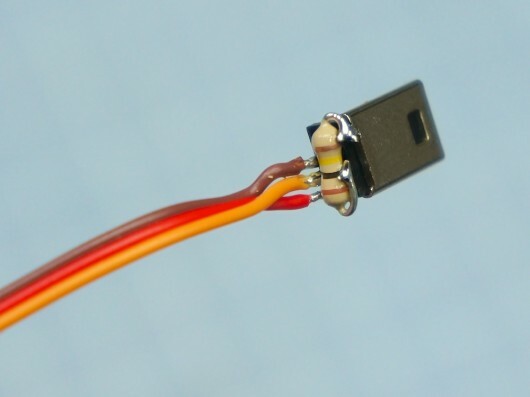 As mentioned by some posters above, there is a danger of pushing voltage to GoPro camera if all 3 wires are used on the same servo connector and the VTx is sending voltage. 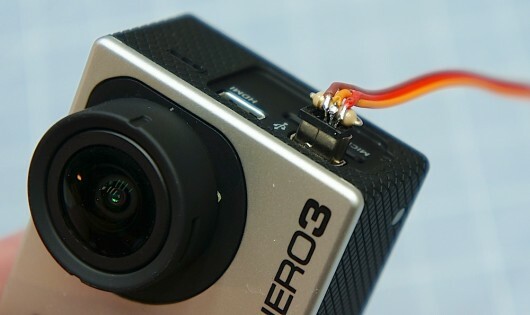 So you NEED to be very careful that you do NOT have voltage going into GoPro through the USB connector. If no voltage is present, I don’t see any danger. One last thing I wanted to mention is that there is a minor inconsistency between the schematic and the pictures shown here. In the schematic, the orange wire shown in the middle(video) but in the actual picture this orange wire is on the signal side. In the end the connections are consistent, orange wire is marked as video and it goes to video pins in both cases, but I think it would have been much better if the schematic has showed the orange wire on the side. This especially might be overlooked by newbies. Has anyone done the something similar for the GoPro 4? Does anyone else have problems with the Gopro Hero 3 Silver freezing up on this like I do? The video out works perfectly for about 5 minutes, then switches over to a black screen and the only way to get back to the regular working camera view is to power cycle the GoPro. Any help is appreciated. Has anybody used this cable in conjunction with the storm OSD? I would think that in the case of this device power is not needed to be delivered to the GoPro, rather just the signal out and ground cables need to be used. My concern is with the OSD working with 12v while the USB generally wants to work with 5v. Can anyone share their experiences using a Storm OSD? 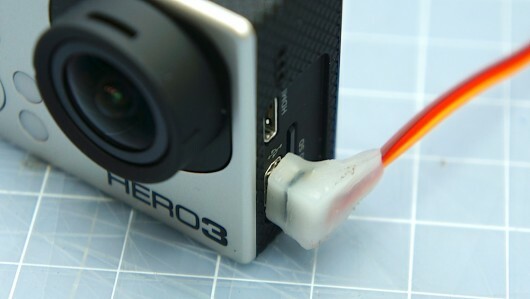 Does anyone know if this cable can be used on the GoPro Hero?